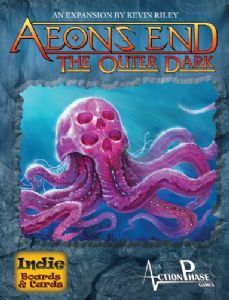 Aeon's End: The Outer Dark is an expansion for the standalone Aeon's End titles that features two new nemeses and two new breach mages, as well as player cards and nemesis cards. Aeon's End is a cooperative game that explores the deckbuilding genre with a number of innovative mechanisms, including a variable turn order system that simulates the chaos of an attack, and deck management rules that invite careful planning of every discarded card. Promos from the Aeon's End Legacy campaign, that were not labelled "Kickstarter Exclusive" went into the Buried Secrets expansion. This Expansion provides content for existing Aeon's End games but is not to be used in the Aeon's End Legacy campaign. Aeon’s End: Legacy is the first legacy cooperative deckbuilding game. The Reset Pack provides all of the cards, mats, sticker sheets, and tokens that players will need to reset the game so that they can play through the campaign again. War Eternal is a standalone game compatible with the cooperative deck-building game Aeon's End. The Depths is an expansion for the cooperative deckbuilding game Aeon's End.